5 oz., 65/35 poly/cotton. Three-button placket. Flat-knit collar and cuffs. Hemmed bottom with side vents. 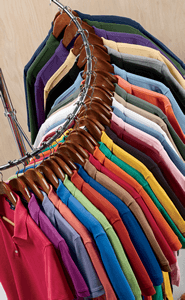 Special blend of polyester with cotton gives the polo a soft, silky hand and helps reduce shrinkage. Set-in sleeves. Sideseamed. Short-sleeves. White is 5.6 oz.